Zeiss Victory T* FL Diavari 6-24x72mm, Like New! Description: The Victory FL Diavari 6-24x72 T* from Zeiss puts enhanced clarity, long-range capability, and startling low-light performance to the top of your receiver. Starting at 6x the FOV is wide enough for mid-range target acquisition, dialing up to 24x brings distant or smaller targets in close for exacting shot placement. The superlative 72 mm objective brings twilight performance to a new level - at 24x the exit pupil is a remarkable 3.0 mm. The construction and functionality of this fine sighting system is quite remarkable. The robust and waterproof 34 mm main-tube is o-ring sealed and filled with dry nitrogen to ensure all-weather performance. The low-key finish is refined yet unassuming. Parallax correction side-focus knob corrects parallax error from 50 yd/55 m to infinity. The tall target-type turrets are lockable, and they offer 1/4 MOA adjustments with a rectangular adjustment range of 25.2 x 57.6 MOA. The illuminated #43 reticle (see pics) is placed in the second (non-magnifying) focal plane. This would be an amazing scope for an ultra long range target/tactical rifle eg. .338 Lapua! 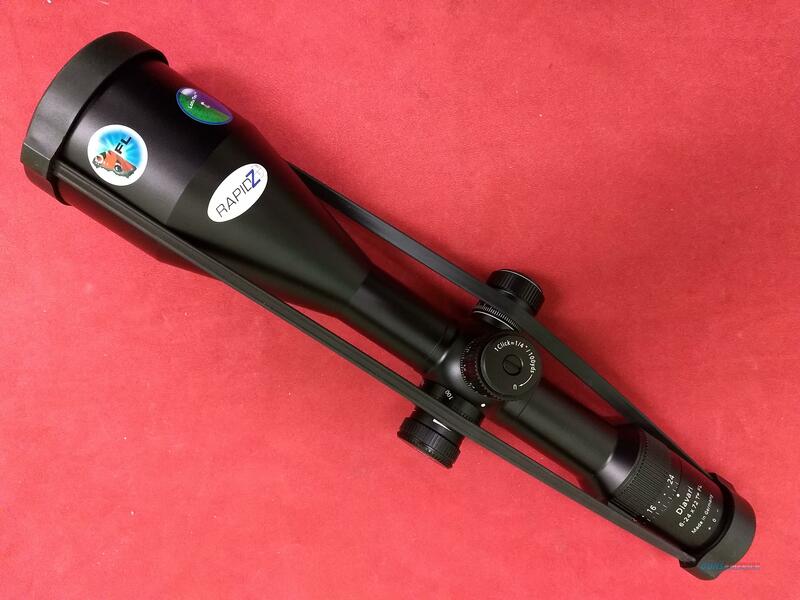 This scope is pre-owned, but unused. It comes with the factory box and papers.